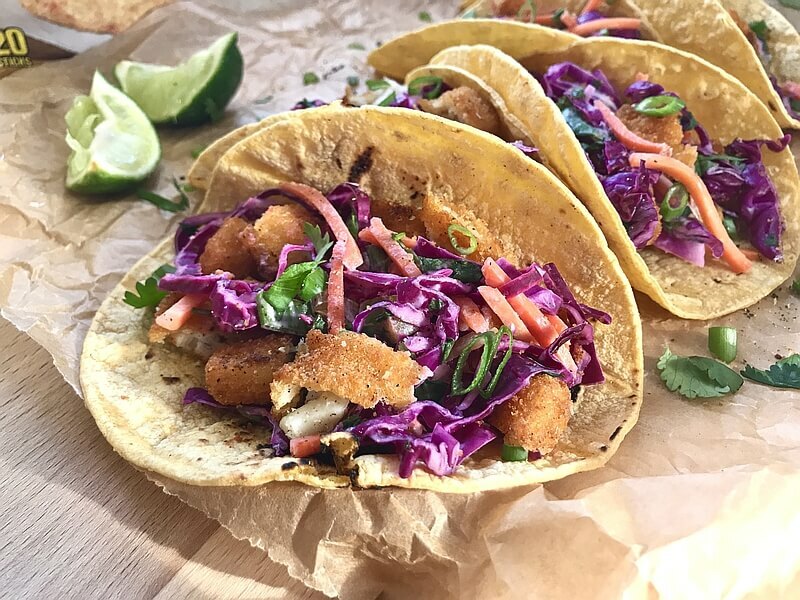 These Crispy Fish Tacos are a semi-homemade match made in heaven! They’re made with Gorton’s Panko Crusted frozen fish sticks, which makes these a super-convenient weeknight wonder. 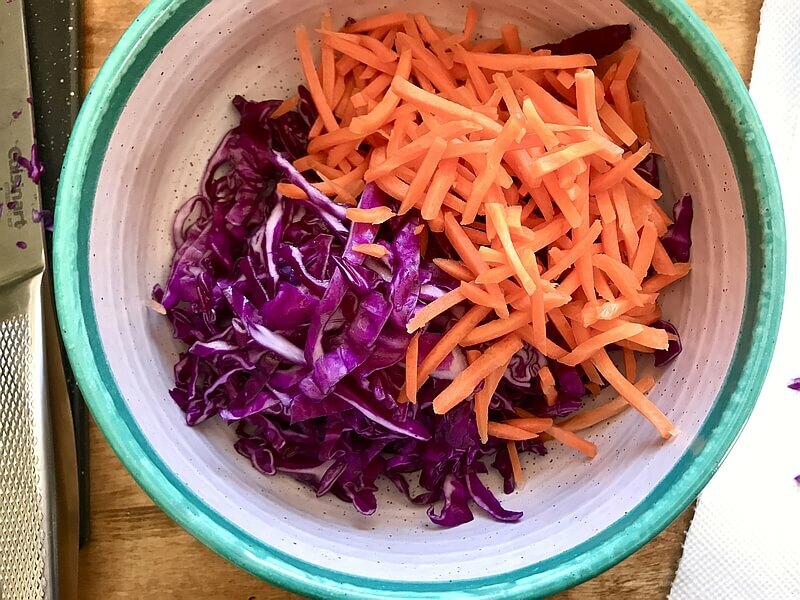 And the fresh, crisp, and flavorful cabbage slaw that you’ll throw on top of each taco finishes it off with the most delicious crunch! This post is totally sponsored by Gorton’s. The recipe, photos, opinions, and fish stick eating are all me. Sound good? Holy smoooooookies! These tacos have been giving me life lately. 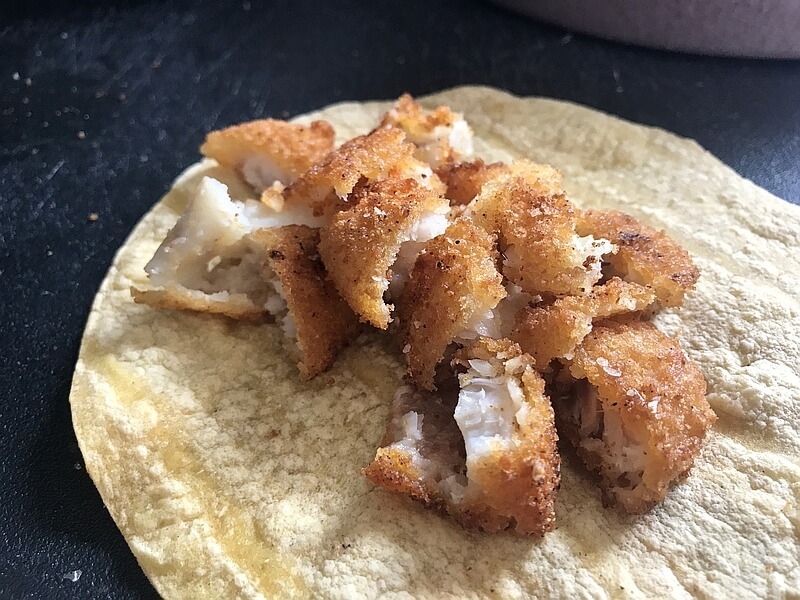 Over the past several weeks, I’ve teased these Crisp Fish Tacos over on Instagram, and I’m happy to say – Here they finally are, folks! I know you’re gonna love’m! Let’s talk about fish for a minute, alright? I know I know, I don’t have a lot of fish recipes. In fact, I think I’ve created approximately one aside from this… and I’m not even sure it counts, because it’s a Tuna Salad. I actually do like a good piece of fish! But look closely… hiii that’s tiny little me waving, all the way down here in Illinois, a land locked state (besides Lake Michigan). Fresh and inexpensive fish isn’t available like it is for you lucky friends near the coasts. If we want to buy and cook up some good fish- and I mean really good, fresh fish- it’s not cheap at all, and it can be hard to find. 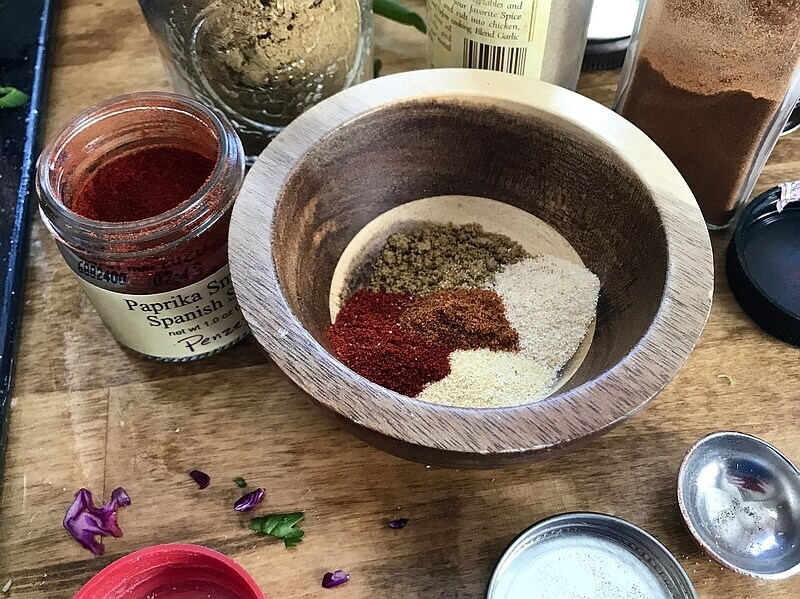 So taking all this into account, we’ve been looking for a way to create a fish-based recipe that’s delicious (of course), quick and easy to prepare, and also budget-friendly, no matter how near or far you’re located from the ocean. 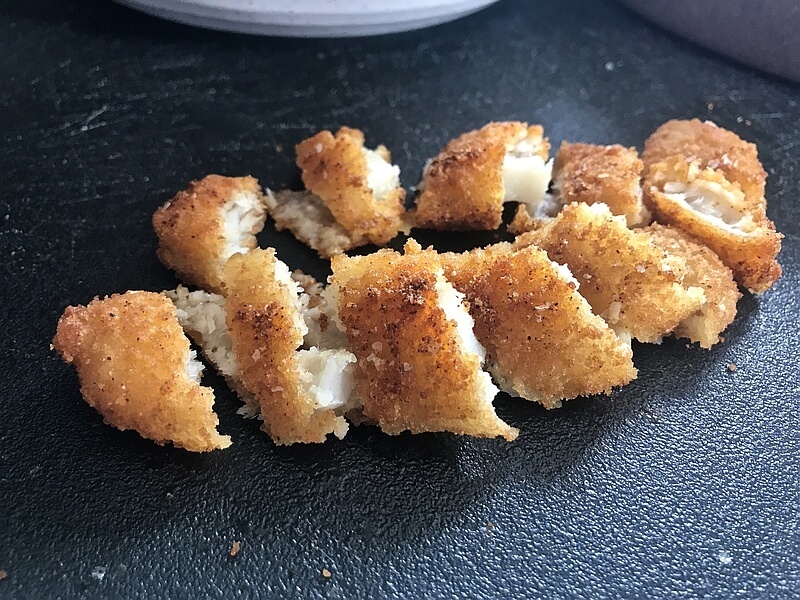 That sounds like a pretty tough task, but y’all, we are lovin’ on these wild-caught Alaskan Pollock Panko Breaded Fish Sticks. They’re solid pieces of fish cut from the whole fillet, not processed and compressed like some drive-thru nuggets. Real honest, y’all… Before we tried these, I never bought fish sticks, because of the whole “minced fish pieces” idea… These sticks are the opposite of that. They’re flash-frozen at the absolute peak of freshness, so they don’t taste fishy at all. I repeat, they taste amazing! Gorton’s means business, it’s printed right on the bag- “Not Minced,” and it’s underlined. These are my people- they get me. 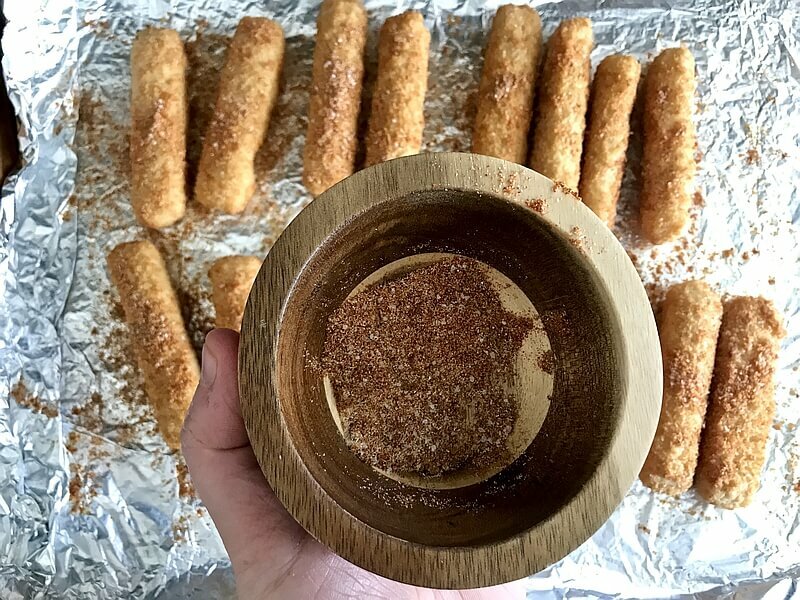 Not only do I love these lil fishy sticks, but Pepper and Eric are obsessed too, which makes them a life saver in this kitchen! I guarantee from now on, I’ll be keeping a bag or two in our freezer at all times. 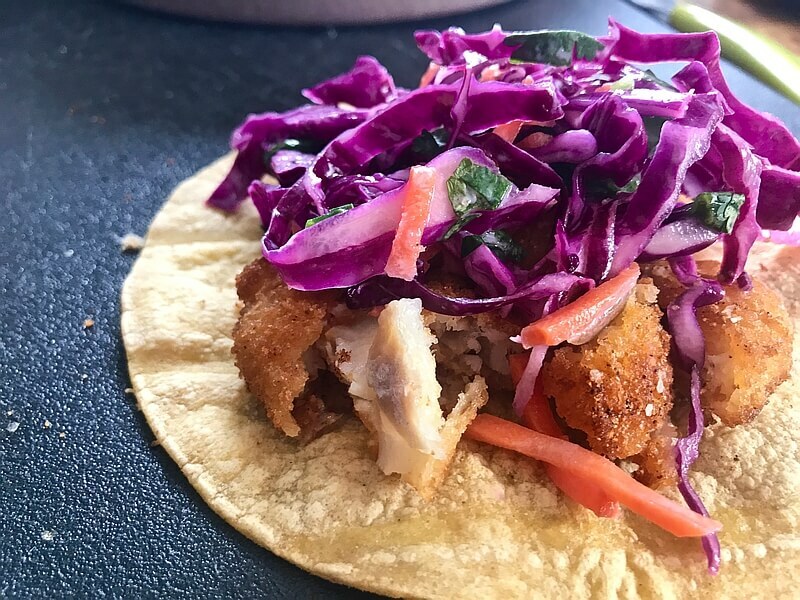 Since this year began, we’ve thrown these Crispy Fish Tacos together once a week. We also love just tossin’ some fish sticks & tots on a sheet pan for lunches. So easy, so good! For my WW readers, they are only one point per fish stick and so filling! I love that we’re incorporating fish into our diets because its full of protein, low in fat, and full of those omega-3 fatty acids. Heeeyoo! Healthy. Y’all, I never imagined that fish sticks on a taco would become somethin’ that I really love and look forward to… But well, here we are again. You guys know me, and ya know I wouldn’t make things like this up. So go on out and grab yerself’a bag’o these Gorton’s Panko Crusted Fish Sticks. 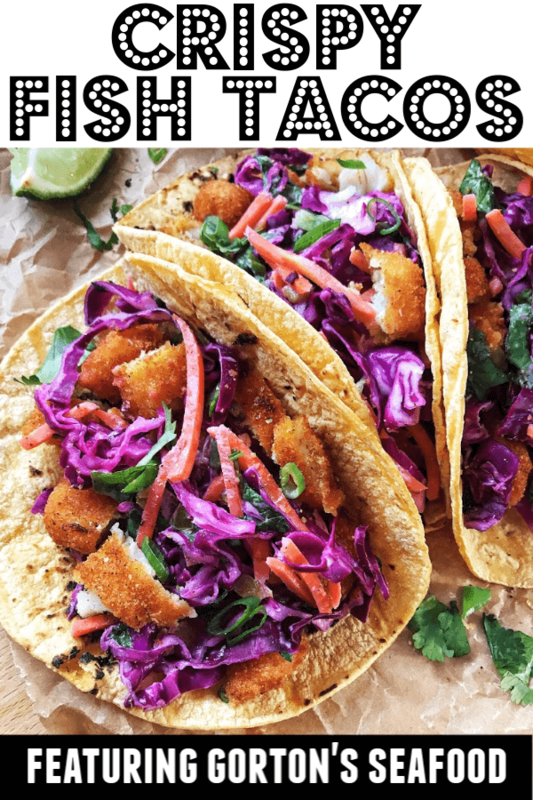 And while you’re at it, be sure to grab up all the ingredients to make these Crispy Fish Tacos… because I’m thinkin’ you’ll be just as in love as I am. Let’s get into that kitchen! First off, we’re gonna grab some cabbage. Try to slice it into very thin strips. You’ll need about two cups total, which is about 1/4 of a large head. These next couple steps are optional especially if you wanna make up the slaw and store it in the fridge for a few hours or the night before taco night to make things even easier on ya. Throw yer thinly sliced cabbage into a colander, and sprinkle with a teaspoon or two of kosher salt. The salt will help to draw out the excess water that’s in the cabbage. If you plan on makin’ up the slaw and then eating it right afterwards, it’s not super necessary. But cabbage is known to release water over time, so it’ll just add a bit of moisture to the finished product. As always, try it out and see what you prefer! Chop up the white and green parts of a few green onions and about 1/4 cup of cilantro, and grab 1/4 cup of pickled jalapeños (about 2 tbsp minced). NOTE: You can also just add the pickled jalapeños to taste. For us, the pickling process removes a lot of the spiciness. This varies by brand, and every person has their own personal definitions of “Not spicy enough,” “Way too hot,” and the Goldilocks zone – “Juuust Right!” So the first couple times, you may wanna add/taste until you find the right balance for you and your family – totally fine! 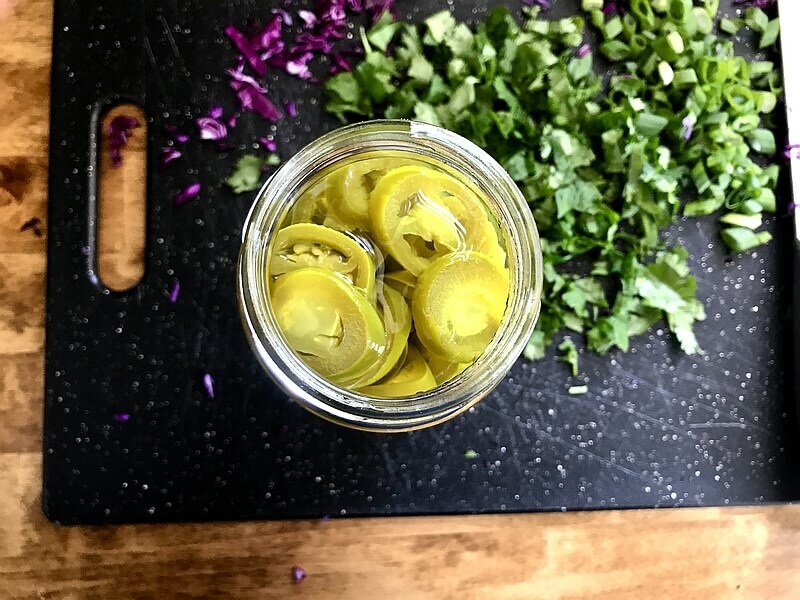 You can find pickled jalapeños in any grocery store near the pickles. Throw the cabbage in a bowl, and add about 2 cups of shredded carrots. You can find bags of already shredded carrots in the produce section. Tip: This is a good time to start preheating your oven to 450. 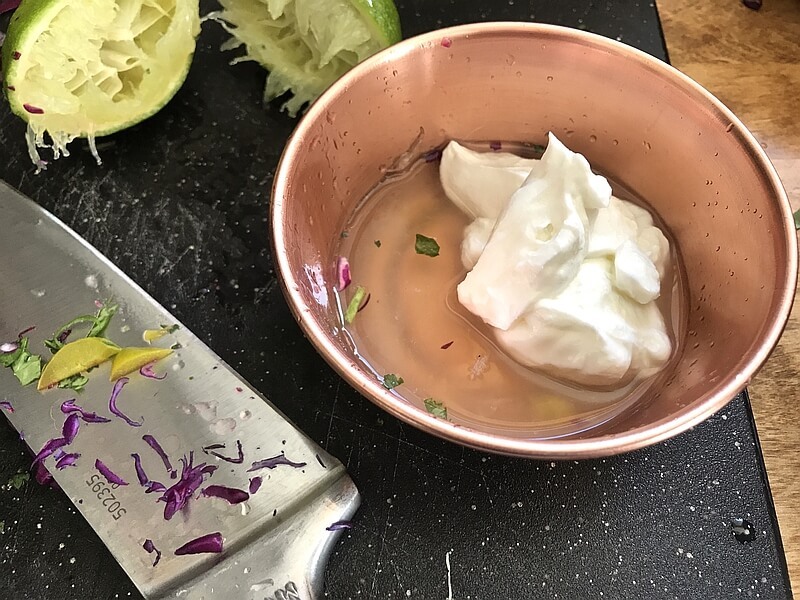 Now grab a small bowl, and add two tablespoons of nonfat Greek yogurt, the juice of one lime, and 2 teaspoons of pickled jalapeño juice. Whisk it all together! Tip: If your lime seems tough place it in the microwave for about 12 seconds, then firmly roll it on the counter under your hand. This method will give you the most juice outta your lime! Toss in the chopped pickled jalapeño, cilantro, green onions, and Greek yogurt mix. Stir together well, and salt and pepper to taste. It’s a very light “sauce”, but it gives good flavor to the crunchy cabbage and carrots. I love it! 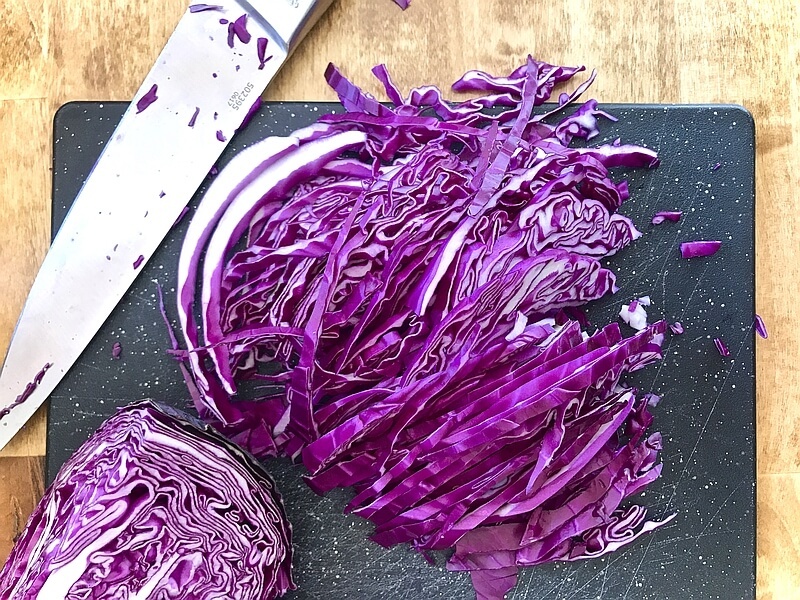 I never realized how much I love a good slaw until I made this for the first time! Grab yer Gorton’s fish sticks, friends! Spray a sheet pan with a little cooking spray and line’m right up. You’ll need 16 fish sticks. Now for our quick spice mix! You’ll need 1/2 teaspoon each of smoked paprika, cumin, onion powder, garlic powder, and kosher salt. Also add in 1/4 teaspoon of cayenne pepper, for just a tiny kiss of heat. Stir it all up real good. Sprinkle it over the top of the fish sticks, spray the tops with a bit of cooking spray. Then flip’m over, sprinkle the other sides with the rest of the spice mix, and once again spray’m with a bit of cooking spray. The cooking spray part just helps the spices kind of adhere to the sticks while they are cookin’ up. Throw’m into a 450 degree preheated oven, and cook for a total of 18 minutes. Be sure to flip’m half way through the cooking time. Now grab some extra thin corn tortillas. I use the Mission brand, They are one of my best food friends. 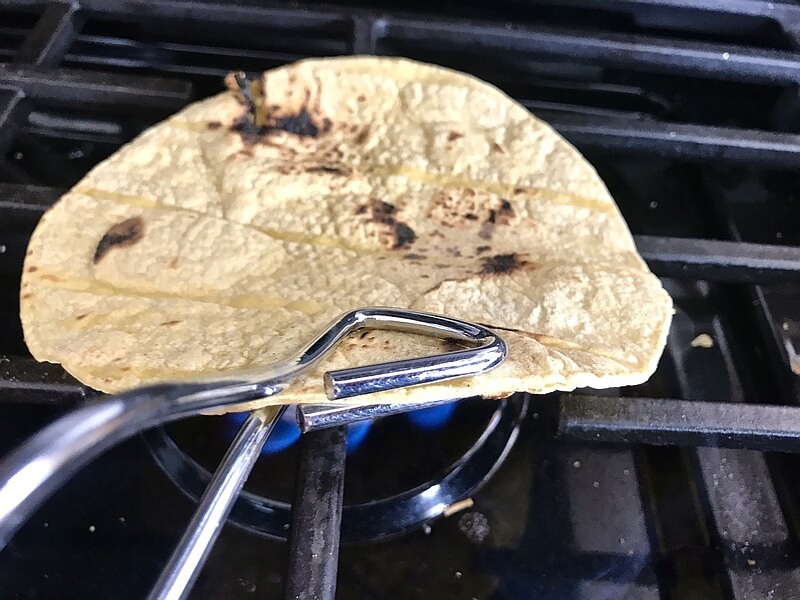 Heat’m however you normally heat up tortillas. Over the burner. This is my favorite way, but obviously you’ll need to have a gas burner. You do need to kinda babysit these while doing it because they can burn quick, but ya can’t beat those lil char marks! In the microwave. You can wrap a few at a time in a lightly damp paper towel, and heat them for about 30 seconds. Check them and if they don’t seem done, wrap’m back up and do another 20 seconds. In a pan. Spray a little cooking spray into a non stick frying pan and heat a couple at a time. In the oven. You can wrap’m up in foil and throw’m in the oven with the fish sticks while they are cooking. I would put them in halfway through, after flipping the fish sticks. They don’t need the whole 18 minutes at 450 degrees. Fish sticks are done! Yuuuuuuuuummmmmm. 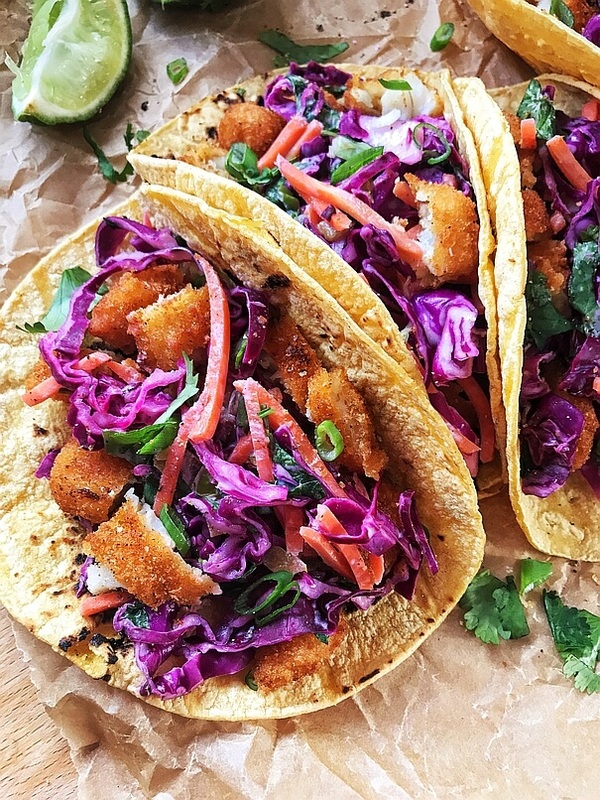 Now let’s build these crispy fish tacos! You’ll need two fish sticks for each one. I chop up two at a time, and then pile’m on the taco. and theennn, pile on the slaw! You’ll most likely have a little slaw left over after. It’s actually zero points on WW, so I pile on a ton, and then eat it on the side too. Soo good! And just like that we’re done! Oh my gosh y’all, like I said before, I never thought I would be saying that I’m obsessed with fish sticks on a taco, but I am. Boy oh boy, I sure am. Bye now, I have to go make these again! I hope you all love’m as much as we do!! Please let me know how it goes. 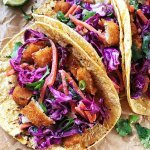 These Crispy Fish Tacos with a fresh, crunchy slaw are the perfect fast & healthy weeknight dinner! With the help of Gorton’s Fish Sticks from the freezer section, it’s perfect for a quick, fresh, and delicious meal! 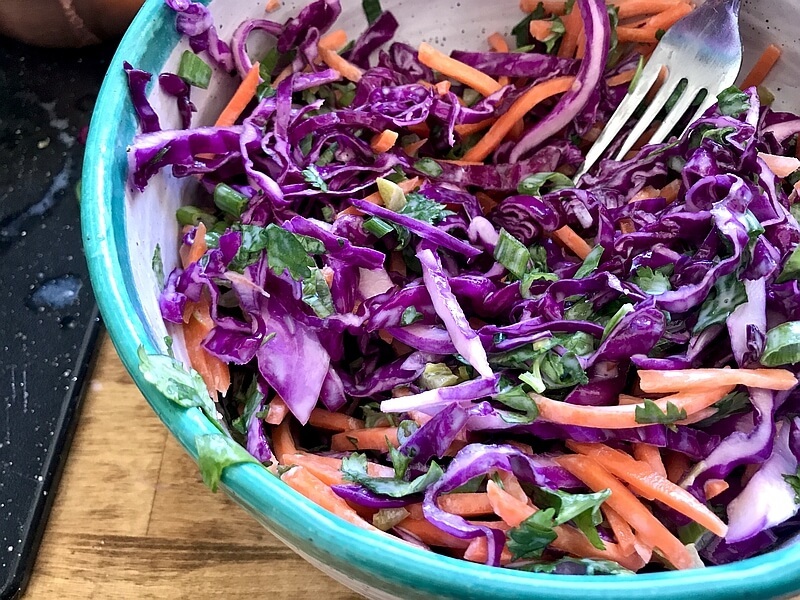 Add sliced cabbage, shredded carrots, chopped pickled jalapeños, chopped cilantro, and chopped green onions to a medium bowl. In a small bowl add greek yogurt, pickled jalapeño juice, and the juice of one lime. Whisk together thoroughly with a fork. Salt & Pepper to taste. Add the greek yogurt mix in with the vegetables and stir together to coat everything. Salt and Pepper to taste. Set aside. Optional Tip: IF you’d like to make the taco slaw ahead of time. 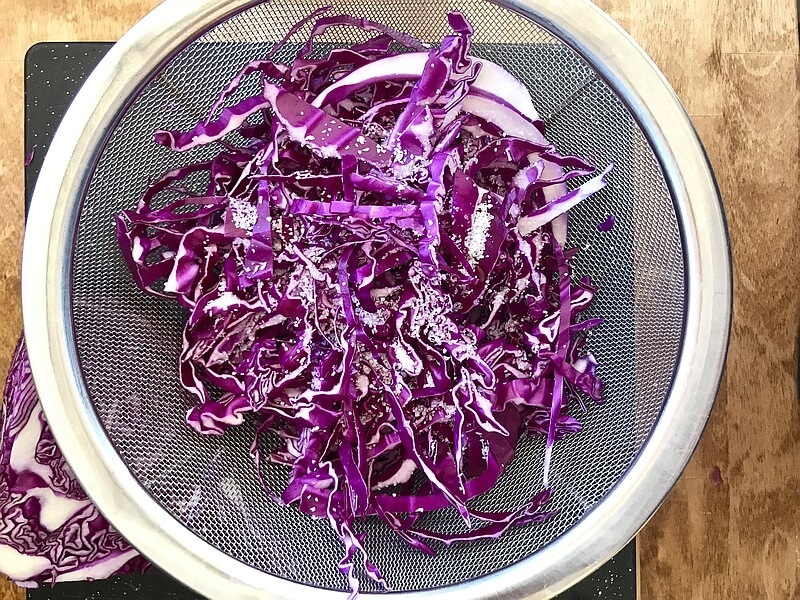 Place sliced cabbage into a colander and sprinkle with salt. Let it sit for about 10-15 minutes in the sink. Then, lay it on some paper towels and dab the cabbage to dry it completely. 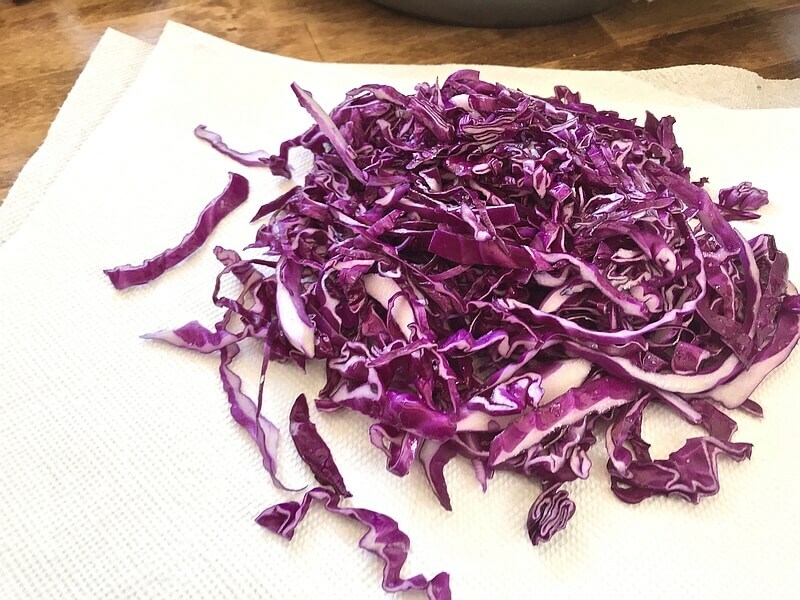 This helps draw out the extra moisture that cabbage holds and will help it keep longer and not water down the slaw. In a small bowl add garlic powder, onion powder, smoked paprika, cumin, kosher salt, and cayenne pepper into a small bowl. Stir together well. Spray a sheet pan lightly with cooking spray. 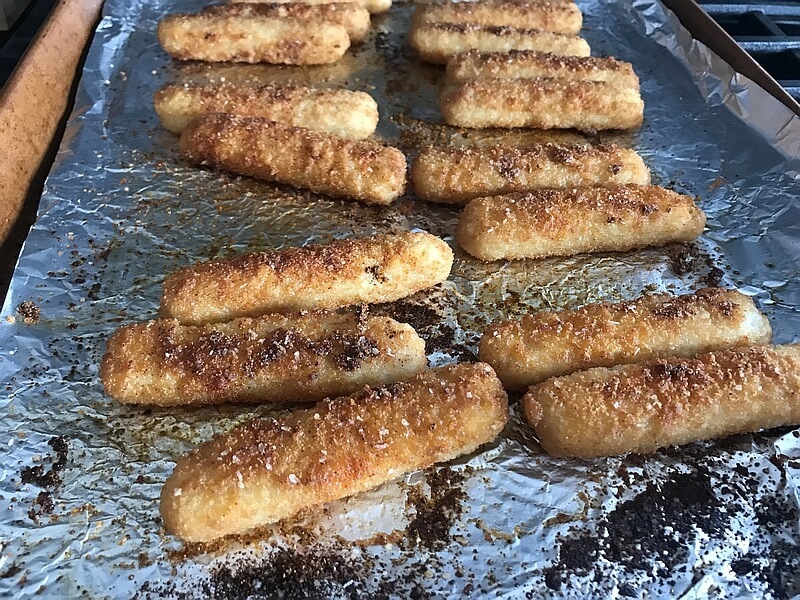 Place 16 fish sticks onto the sheet, sprinkle with seasoning mix, spray tops with a little cooking spray, flip, and repeat. Place in 450 degree preheated oven for 18 minutes. Flipping half way through. While the fish sticks are baking, heat up 8 corn tortillas with your preferred method. 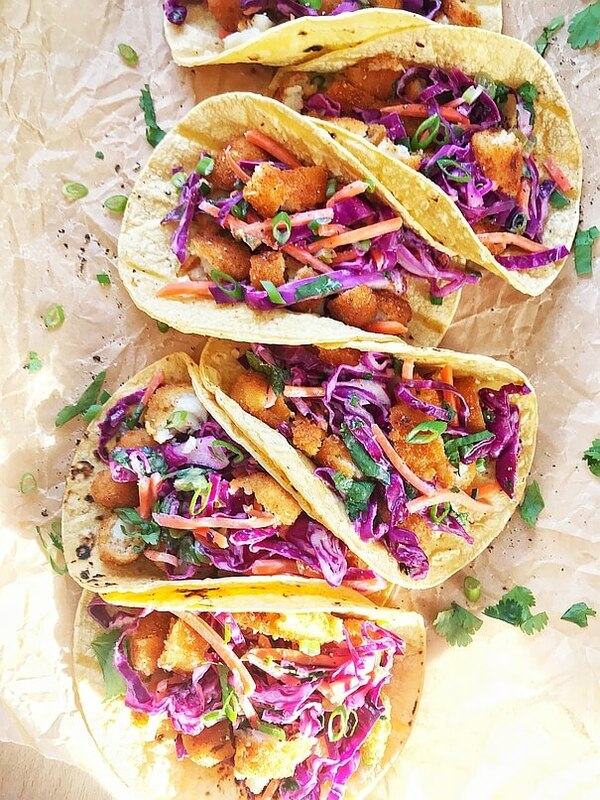 When the fish sticks are done, build each taco by placing two chopped up fish sticks on top of each tortilla and then pile the taco slaw on top. I use a heaping 1/4 cup on each taco, but you can add more or less. You will more than likely have a little leftover to enjoy on the side with each taco. I just calculated these in my WW app and it came out to be 10 points! I used your nutritional information listed. How did you get 6 points? The nutritional information listed includes every ingredient, even the items that are zero points on WW. If you’d like to double check points you can do so in the WW app using the recipe builder. The only items that actually have points are the fish sticks and the tortillas. The nutritional information is provided for folks out there who don’t do WW. I hope that helps! The flavors blended together perfectly. It was filling, too. I served it with some homemade “refried” pinto beans and cilantro lime rice, thinking two tacos wouldn’t fill me up, but they would be enough on their own with the slaw. I was a little worried about how my husband would like the slaw with greek yogurt in it. He loved it! Not to be THAT person, but I ran mine through the WW recipe builder and came up with 9 points. 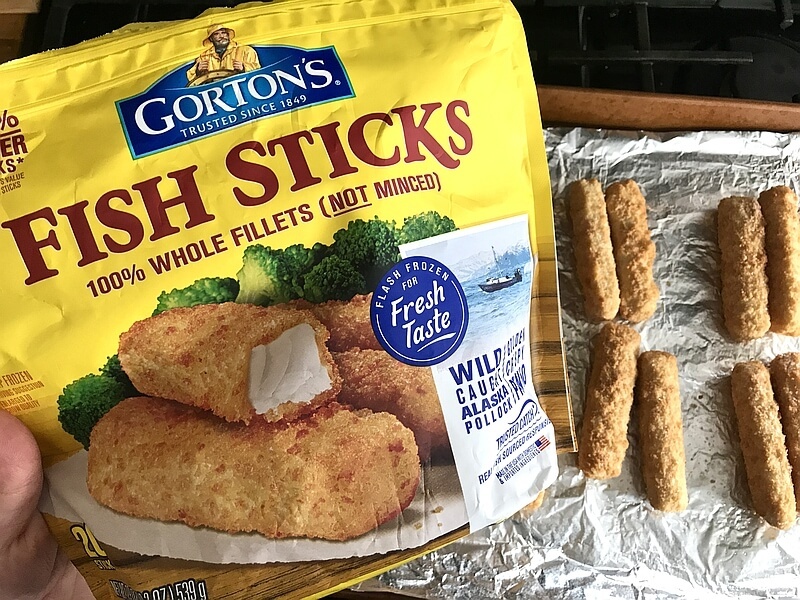 The Gorton’s Crunchy Breaded Fish Sticks alone calculated as 7 for 4,, (230 cals) although it does say it’s 67% bigger sticks on the package, so maybe that’s the difference in points (?). Either way, totally worth the points! Thanks for an awesome recipe that I will be making my family often! Hey Debbie, I am so happy you and your husband enjoyed!! I’m thinking it’s possible they were different fish sticks than the ones I used because I just looked at my recipe builder to double check. Were they they panko crusted? That could be the difference! I loved them. I didn’t use jalapeno in the yogurt, but used chipotle in adobo. I think that is what it is called. Oh, my. I put two fish sticks on the tortilla and the cabbage mixed with the chipotle. I put chopped tomatoes and cilantro yogurt dressing. It was pretty messy, but oh so good. Thanks for the great fish tacos. I will definitely have these again and again. So easy. So happy you enjoyed, Jennifer!! I bet the addition of chipotle was amazing. It’s one of my favorite ingredients to use! My husband said these were the best fish tacos he’s ever had. He wants them for his birthday meal. We all loved them. Kids adored them. Deborah! I hope your husband enjoys them for his special birthday dinner. Oh my heck! These are delicious! Your recipes are so full of wonderful flavors and good WW points! Thank you. Do you know the sodium on this? It looks so good, but I have high bp. Thanks, Kim!! So happy you loved’m! This is amazing and it was a family hit. Even my 2 year old ate it! I’ll definitely make it again. Yessss! So happy you and the fam loved’m up, Jacquelyn!